This faucet replaces kitchen faucets to accommodate installations where adding an additional faucet for filtered water is not possible or desirable. High Quality Chrome Plated solid Brass two in one kitchen faucet. This is a great option for those situations where drilling a new hole in the countertop is not possible or not desired. 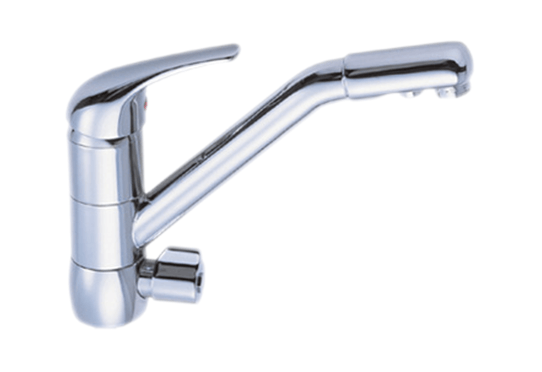 This faucet is designed to dispense regular hot and cold Tap Water and also has a separate outlet for filtered water. The filtered water is controlled by a separate lever on the body of the faucet and the filtered water goes through a separate spout. Replaces your existing kitchen faucet.